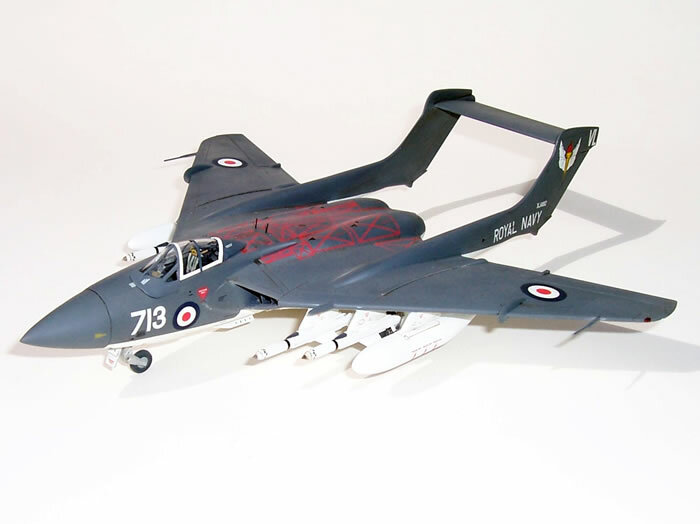 Revell’s re-boxed Frog Sea Vixen sat for years in my stash until I replaced it with a Highplanes kit of the same subject. This too sat for a long time as, despite looking very promising, I failed to muster the energy to clean up its very limited run parts. 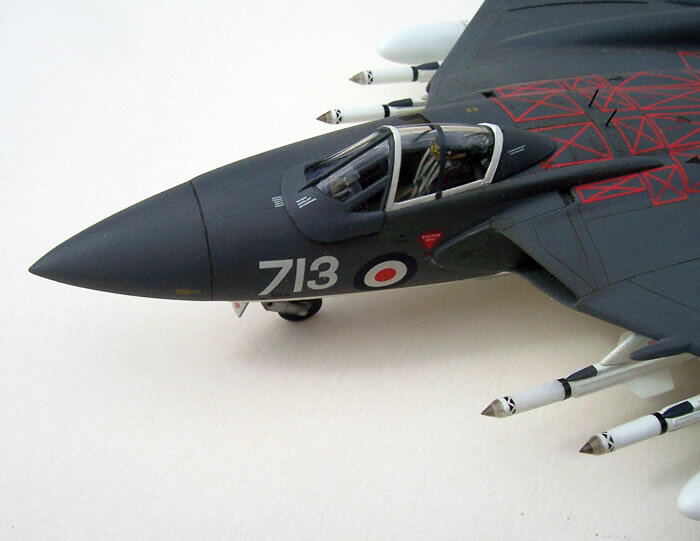 I disposed of my Highplanes kit when MPM announced their Sea Vixen, although it was a long wait until this and its Xtrakit clone became available. The MPM/Xtrakit issue failed to live up to expectations; having as it did some shape issues and several mediocre detail parts, which required a fair amount of FAA Model’s resin to make up for its detail deficiencies. 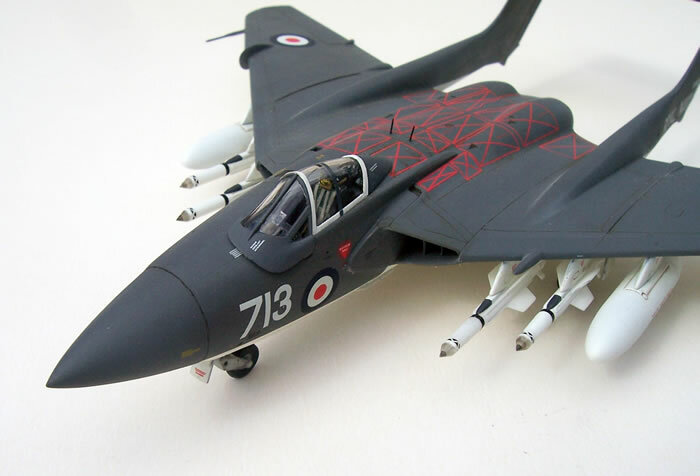 Being a slow learner, I disposed of this kit as soon as Cyber Hobby announced their Sea Vixen. 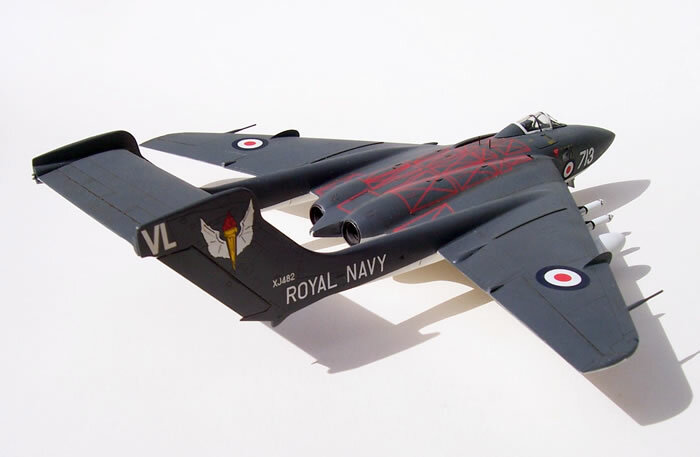 After all, going by their Meteor kits, the Sea Vixen should have been a stunner, right? 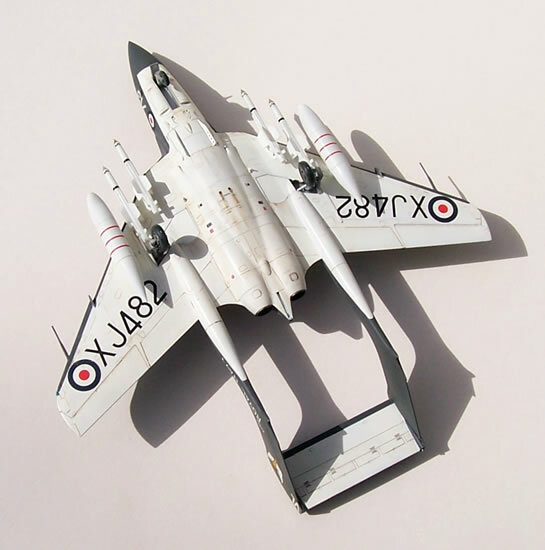 Well Cyber Hobby’s Sea Vixen duly arrived and at first glance showed much promise, in fact for a brief moment it looked as if it would build beautifully. Surface detail looked good, the intakes and engines appeared to be nicely done, and there were several decal options. 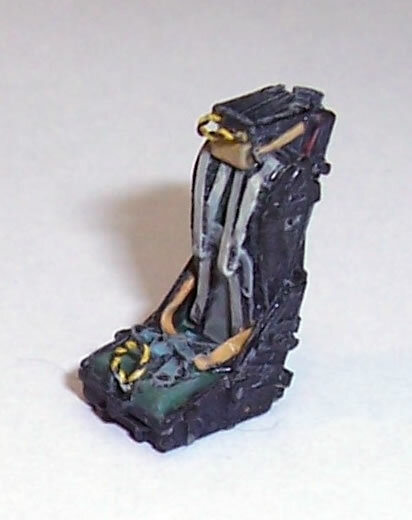 Then I noticed its inexplicably 1/100-scale ejections seats (the same error as MPM), no interior detail in the gaping void left by an open air brake, and the wrong missiles for an FAW 1. The flaps could be modelled lowered, but lacked internal detail, and would later prove awkward to fit closed. The wing fold seemed to me a pointless novelty as the fold detail is basic. Equally pointless in my view was the option to extend the RAT. It was essential to replace the undersized pilot’s seat, and the miserable cockpit interior would need to be replaced for an open canopy model. Most other aspects of the kit were about par for a modern kit, although the oleo scissor links were moulded as solid triangles fixed to the undercarriage legs. Nonetheless, it looked like a quick build to fit in with an FAA group build my modelling mates and I were participating in, so cement quickly met plastic. It was soon apparent that the nose cone’s shape was off, as was the canopy and windscreen. I ordered a replacement Pavla nose, and thought of fitting a Falcon canopy that was intended for the Frog kit. Regrettably, I got lazy when I realised how much work would be needed to fix the canopy. Besides, by this stage, I had found a list of many other faults that I would perhaps have been blissfully unaware of; check out the Thunder & Lightnings website for what I read about Cyber Hobby’s and various other Sea Vixen kits. Aside from the nose and canopy faults, the fuselage underside is too bulbous, the engine decking contours are wrong , the tail booms are too flat and their NACA ducts face the wrong way, the wing fences are the wrong shape, the radome handle is moulded raised rather than flush, and so it goes on. On reading all of this, I thought to hell with fixing the canopy, I could either bin the kit or finish building it. I chose to build it, but now regret not putting in some hard yards and fixing the canopy at least. Come on Pavla! how about a combined resin and vac-from fix for this monstrosity? So what did I do with my build? As I mentioned, I replaced the nose and elected to have closed the air brake, RAT, hook, and flaps; along with lowered wings. The wing fold option means that the wings are harder to build than it would otherwise be; but the real fit issue is with the closed flaps that are less than perfect, and need some fine adjustment. I replaced the pilot’s kiddie booster seat with a Pavla Resin item, but did not bother for the observer, as his seat would not be visible. I also ground out a well below where the windscreen sits and added some pipes, canvas cover and other detail based on photos. Likewise, I scratch built some detail to go inside the sliding canopy. The only other detail enhancements I made were to drill out the oleo scissors and add brake lines. Whilst I remember, do not add and the pry off, as I did, the fuel dump to the starboard wing, this is an FAW. 2. feature. In addition, the wingtip camera pods were specific to a few early aircraft I think, so again do not fit these. The kit’s payload options consist or two drop tanks, two unguided rocket pods and two Redtop missiles. These last items were not carried buy the FAW.1, its guided missile being the Firestreak. It was a pity that four rocked pods were not included, as the Sea Vixen looks good with this payload; but even better, in my view was being armed to the teeth with four Firestreaks. I had two left over from a Trumpeter Lightning F.6 build, and I robbed two more from my un-built Trumpeter Lightning F.3. The Firestreaks were well worth adding I think; as they lend a quite aggressive air to this rather massive all weather fighter. Why Cyber Hobby do some things so well and others so poorly puzzles me, but then look at Revell with their Halifax! If only they would only foster a network of research volunteers to help with photos, measurements, and advice before the moulds are machined. 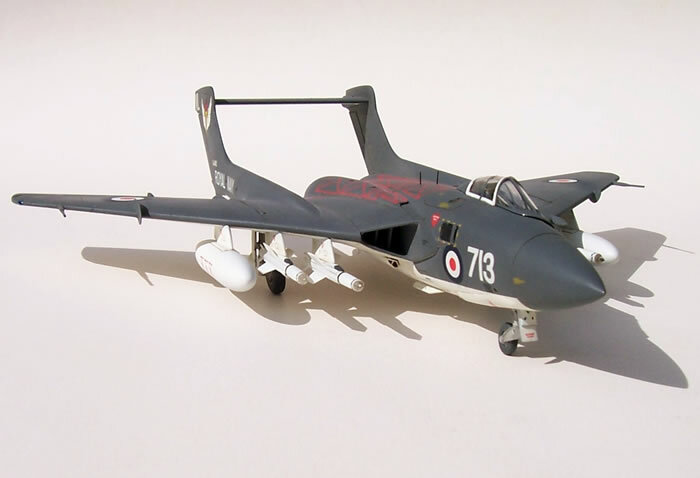 For me the joy meter took quite a plunge as I realised that my Cyber Hobby Sea Vixen was a bit of a dog’s breakfast. If you want a reasonably easy build that resembles a Sea Vixen in the one true scale, build Cyber Hobby’s kit. 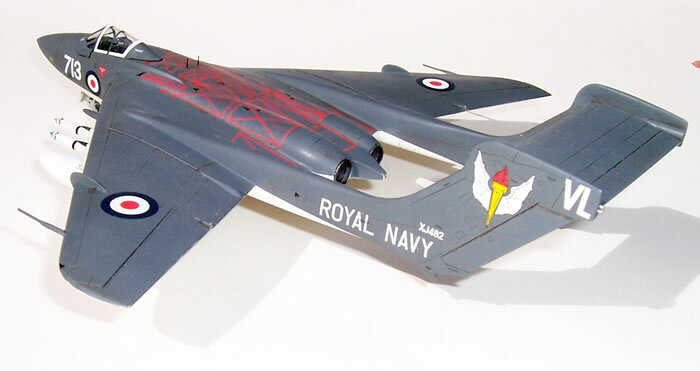 If you want a much more accurate model that looks like a Sea Vixen should, build the Highplanes kit if you can find one. If you want accuracy and easy build, then forgive me my sins and call out the plastic inquisition, for I am truly a heretic when I say - build the Airfix 1/48-scale kit!